The death of "Star Trek" actor Leonard Nimoy isn't just a blow to the hard-core sci-fi fans, it's a loss for real space explorers as well. Nimoy was best known for portraying logic-minded Mr. Spock on the original "Star Trek" series. The show spawned a franchise, encompassing five TV shows, 12 movies, an animated series, a language (Klingon), games, toys, a Las Vegas attraction and legions of "Trekkies." But "Star Trek" was also an inspiration to real-life space travelers. NASA Astronaut Scott Kelly, who is preparing to travel to the International Space Station for an unprecedented year-long mission, sent out a tweet saying Nimoy "popularized #space travel for generations to come so we may live long and prosper." "So many of us at NASA were inspired by Star Trek," the space agency tweeted, following news of Nimoy's death. In 1976, NASA unveiled the space shuttle "Enterprise," named after a write-in campaign by Star Trek fans. A physicist from NASA's Goddard Space Flight Center even took the time to break down the scientific validity of fictional technology from the series. For example, those chest-pinned "communicators" have lots of similarities to cell phones, but the idea of building technology that instantly translates any language? Not possible, scientists say. The influence went the other way too. Nimoy spoke at the National Space Symposium in 2010 and credited the Apollo 11 mission with popularizing "Star Trek" after the original series ended its 3-year run. Nimoy said the July 1969 moon landing caused people to "look at Star Trek in a new and different way. There seemed to be a potential reality to what we were doing." 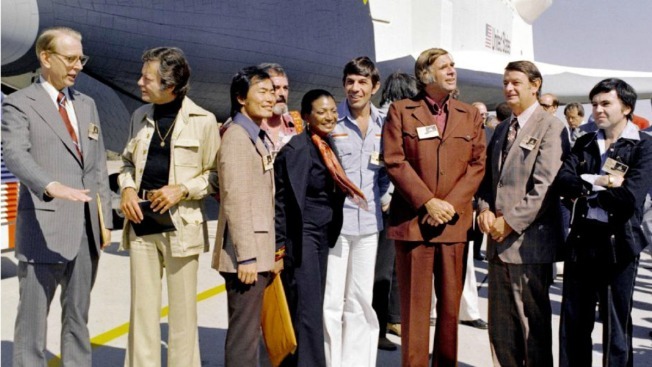 Other cast members from the original "Star Trek" TV show have had relationships with the real astronauts. Nichelle Nichols, who played Lt. Uhura, said she helped NASA to recruit female and minority astronauts. "Lots of us grew up with Star Trek; it's in our minds when we're doing all this," said Glenn Bock of NASA's Goddard Space Flight Center, when "Star Trek" actor George Takei paid them a visit in 2008. Physicist Richard Obousy told Discovery he was inspired by the faster-than-light "warp drive" technology from "Star Trek" in his quest to send a probe to another star. He said that at its core, Star Trek "is about human creativity and the vast potential of technologies that inspired human minds to construct."